ASLogger is a reliable, easy-to-use, easy-to-configure call recording and voice logging software solution designed for small to large business environments. ASLogger Call Recording and voice logging software is powerful, scalable, affordable, and a customizable solution for inbound and outbound calls. Our Call Recording and voice logging software has the ability to record multiple line types such as analog, proprietary digital PBX, T1/E1, ISDN, PRI, BRI, and VoIP lines. We are a team of developers with strong experience in designing call recording software more than 10 years and developed a recording solution to meet requirements for a variety of industries. If you need a specific feature or integration with our call recording software solution, we can provide professional services to customize our call recording software to meet your specific requirements. Call Evaluation (To Score calls and evaluate agent's and business performance). ASLogger Call Recording Software allows businesses to continuously record on a reliable and steady platform. You can quickly search specific call recordings based on date, time, extension, caller id, call ranking, call direction, call type, comments and much more. Play the calls directly or remotely from your PC and make comments, bookmark, call rating or export the call in standard WAV format or WMA format for review. 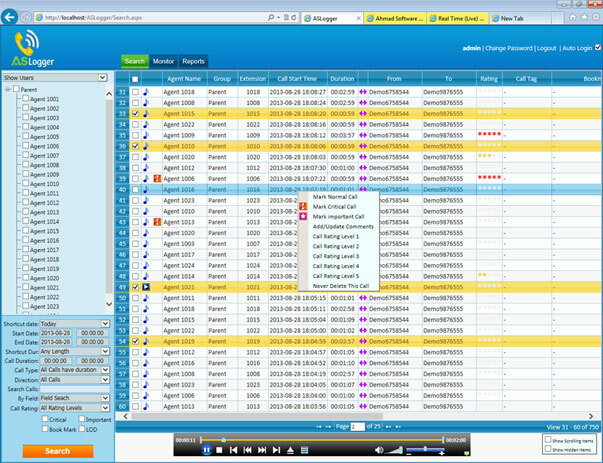 Using ASLogger as the recording engine, all the calls are recorded and stored on the ASLogger server. Accessing the calls via browser based ASMonitoring System, calls can be bookmarked, commented, flagged, ranked and listened to. You can rewind live calls 10 minutes back instantly. Browser based solution to access recordings and live calls easily. Live Monitor Calls and Capture PC Screen Activity. On the spot add call tagging, rating, and bookmarking. Run Custom Reports and Improve Business Operations. Reduce Your Liability and Ensure Regulatory Compliance. Easy Retrieval of Call Recordings and Data. Auto Archive Recordings for Virtually Unlimited Storage. Unlimited Tests for Training and Quality Control.